Forging brilliant futures one student at a time. 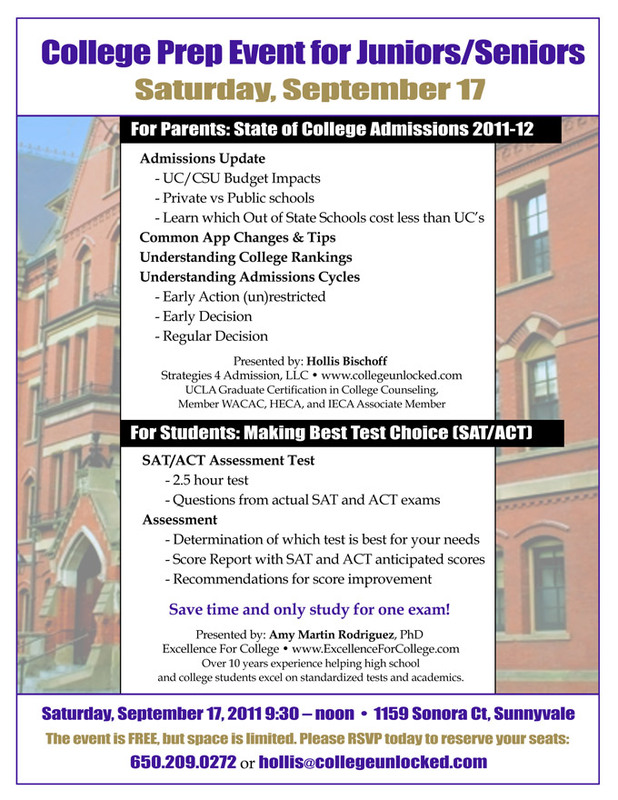 SAT or ACT – Which is Best? Please call or email us for scheduling details on these TBA classes. Space is Limited – Sign up now! When you are committed to the best, where do you start? When you do everything possible to see your child excel, what do you look for in an Academic Coach or a Test Prep Program? At Excellence for College we guide your child to take active responsibility for their academic success. We build a solid foundation so they excel now, in their college classes, and in life. We deliver a personalized yet rigorous structure to keep your child inspired and on track toward high grades and their best test scores. Assess student’s specific needs. Customize lessons. Teach tools. Reveal strategies. Structure accountability. Inspire dedication. Personalize targeted testing. Require rigorous practice. Track results. Evaluate progress. Redirect efforts. Repeat. I can’t believe that I started out our sessions with a 1600 and ended up with a 2200. All of the essay and critical reading torture truly worked miracles and I want to thank you once again for your help. You helped increase Preeti’s score to a 2250 and she is now feeling much more confident about getting into Berkley. Thank you so much for all of your help in making preparation for the SAT and SAT Chemistry Subject Test so painless. Amy quickly assessed what she (my daughter) needed to boost her (SAT) score… I didn’t totally believe that this was going to translate into a real score improvement on the official test. But it did (2360) and my little girl is on her way to Georgetown! Within a month and a half Alyssa’s score increased by 700 points. We really like the fact that Amy adjusts the assignments to Alyssa’s needs. We’re very grateful to Amy for all of her help. Amy provided outstanding tutoring to my daughter. A friend recommended Amy to assist my daughter in Honors Chemistry. Amy helped my daughter to really understand the concepts and to be able to answer the most difficult problems. You are a breath of fresh air, and clearly excited about what you are doing. To be able to offer guidance and instill more self-confidence in our kids is a wonderful thing. Sneha got her score and I am so excited I start crying. She get 2310. You should take your son or daughter to Amy even if she have good grade. She make sure your daughter get top SAT score. Amy helped my daughter acquire the skills she needed along with a new confidence that I haven’t seen in her before. She went into the exam (SAT) confident that she was going to do well and she did. She got a 2340. SAT* or ACT? Which test is Best Test for You?